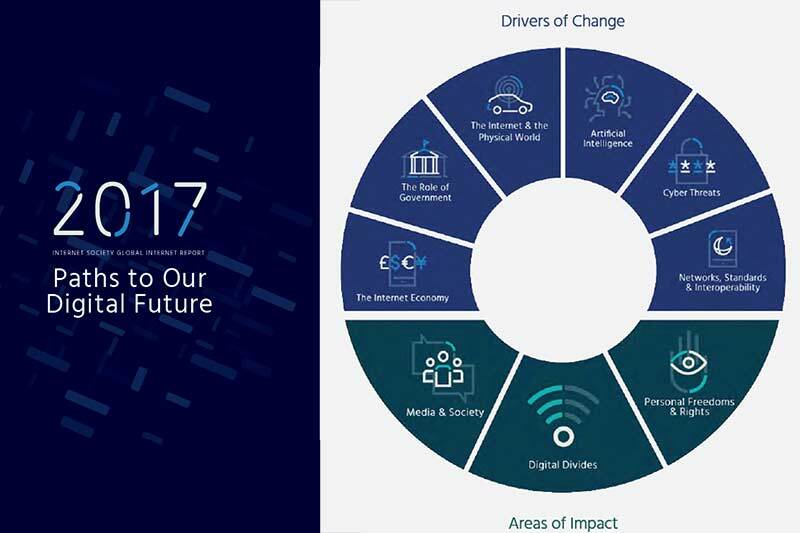 The Internet Society (ISOC) released its Global Internet Report 2017, entitled “Paths to our Digital Future.” ISOC is a global non-profit, established in 1992 and is dedicated to ensuring the open development, evolution and use of the Internet. The 2017 report examines the potential future Internet over the next five to seven years, identifying six drivers of change: 1) The (convergence between) Internet & the Physical World; 2) Artificial Intelligence (AI); 3) Cyber Threats; 4) The Internet Economy; 5) Networks, Standards & Interoperability and 6) the Role of Government. The report looks at the impact of these drivers on digital divides, personal freedom and rights, as well as media and society. The Global Internet Report was developed through research carried out by the Internet Society and its global community over an 18- month period beginning in 2016. Three global surveys, two regional surveys and ten roundtables were conducted in addition to interviews of more than 130 Internet experts representing government, academia, international organizations, businesses and Non-Governmental Organizations. Many of the thoughts expressed in the report illustrate a strong, commonly-held belief in the potential of the Internet to continue to bring positive change to people’s lives, with benefits delivered across education, health, economic prosperity and social change. However, there are also wide-ranging fears that the Internet may be viewed and used differently in future. For example, there are concerns that efforts will be made to restrict Internet freedoms through centralisation, mass surveillance and fragmentation. There are worries that the media landscape will become more difficult to navigate and that separating fact from fiction will become ever harder. Some are also worried about the threat of new divides and how these will not only deepen existing disparities between countries, but also across society as a whole. The report notes that with the convergence of the digital and physical worlds and the deployment of the Internet of Things (IoT), services will become more efficient and data driven, providing new ways for us to interact with the world around us. However, increased security threats and device vulnerabilities, as well as incompatible standards and a lack of interoperable systems, could undermine the technology’s promise. Appropriate safeguards and deliberate efforts to ensure transparency and user control are required to ensure that IOT driven data collection does not further undermine privacy. Similarly, AI promises new transformative opportunities, ranging from new services and breakthroughs in science, to the augmentation of human intelligence and its convergence with the digital world. But concerns have been raised about its unfettered development without appropriate human-centred safeguards. AI also raises serious considerations related to privacy, transparency, safety, the nature of work and jobs, and the overall economy. For example, facial recognition based on AI can improve user experience over a social media platform. But the same technologies can be used to improve surveillance and compromise anonymity. Or, if AI becomes a permanent feature in social media networks and online platforms, where algorithms are used to curate the online experience, questions about free choice and bias will intensify. The report says that ethical considerations must be prioritised in the design and deployment of AI technologies and humans must remain in the “driver’s seat”. The report states that the hyper connected Internet economy will see traditional industries morphing, emerging economies thriving and new market leaders from around the globe driving innovation and entrepreneurship. But it is not clear at the moment whether this technology-driven disruption will favour the existing Internet platforms or bring greater competition and entrepreneurship. As the physical and digital worlds continue to converge and AI and IoT increase our dependence on the network, the severity of security challenges and vulnerabilities grows in parallel. Simultaneously, the continued success of the Internet as a driver for economic and social innovation is tied to how we respond to these threats. Insufficient attention and inadequate response to cyber threats will undermine trust in the Internet. New accountability, incentive and liability models may need to be considered to encourage greater engagement from stakeholders and ensure human safety. At the same time, the report takes note of the latest incarnation of the old supposed dichotomy between security and freedom. It highlights the risk of the ‘securitisation’ of the Internet, and our digital lives, curtailing online freedoms and global connectivity. Given the growing pressure from cyberthreats and national security challenges such as terrorism, open societies and freedoms and rights could become subordinate to pervasive surveillance regimes facilitated by AI and IoT. Moreover, as global Internet platforms are used to deliberately spread disinformation, users will lose trust in the Internet. Governments are under increasing political, economic and social pressure to respond to cyber threats, terrorism and violent behaviour online. The report cautions that measures that may be intended to secure cyberspace will increasingly undermine personal freedoms and rights and that without a change of course, personal freedoms and rights online may well be nearing a point of irreversible decline. Mr. Singh said, “The main reason why the Internet has been so successful is because it is open, people have been allowed to be creative on it. Innovation has been allowed to flourish.” But there is the global trend of Internet shutdowns. A lot of governments are now taking action from the point of view that the Internet is a threat. Either in terms of civil disturbances or national security threats in terms of the infrastructure that runs on it. The approach seems to be let’s shut down the Internet first and then let’s fix the problem. If you want everything to be digital and pushing for a digital economy, there’s a disconnect there. Governments, policy makers need to realise that there are issues with it but let’s try to deal with them, rather than doing a wholesale segmentation of the Internet or just shutting it down, which is counterproductive. Cyber threats are also leading to a new form of digital divide, between the security ‘haves’ and the ‘have nots’. Users who lack the skills, knowledge and resources to protect themselves and their data will be far more likely to become victims of cybercrime. Addressing this digital security divide will be critical to realising the full potential of the future Internet. Another important development is the evolution of networks, standards and interoperability and the architecture of the Internet. A proliferation of connected systems and mobile devices will result in ubiquitous connectivity requiring greater bandwidth and interoperability. The network edge will become more complex with large numbers and types of devices connecting to multiple new services, such as IoT. And the nature of transit will change with the increasing use of CDNs (A content delivery network is a large distributed system of servers deployed in multiple data centres across the Internet, serving content to end-users with high availability and high performance), caching and other specialised services that flatten the network hierarchy. This may put pressure on the general-purpose Internet and its ability to support competition, and on-going evolution and innovation. Additionally, developers are increasingly relying on proprietary standards which will be a barrier to innovation and interoperability. Open standards development will need to evolve to ensure standards are still relevant in a world of competing proprietary systems. In view of all of the above, governments will be faced with a host of new and complex issues that will challenge all aspects of their decision making. The report notes that their responses to these challenges will impact not only freedoms and rights and the economy, but also the Internet itself. In addition to the challenges related to balancing security and personal rights, privacy and freedom of expression mentioned above, populist trends around the world could undermine decades of interconnected policy goals in ways that could fragment the core architecture of the Internet and undermine its global promise. Mr. Singh said that the worse-case scenario could be the creation of Internet boundaries in line with physical geographical boundaries. It is technically hard to do because the Internet is borderless by design. But China built the Great Firewall.